In 2003 Chris wrote a multi-part series for IBM’s developerWorks. The series drew a lot of readers and even garnered positive comments from open-source icon, Richard Stallman. The articles are still published on IBM’s web site. Each one is also provided here as a PDF. Chris wrote an article for a magician’s industry magazine about the collaboration between the Austin Chapter of the International Brotherhood of Magicians and a support organization for veterans called Heroes Night Out. The magazine is distributed to thousands of members worldwide. This 15-minute radio drama was written specially for the live Cross Time Cabaret program in Austin, Texas, produced in October of 2015. To promote the 2010 Texas Association of Magicians Convention the organizers wanted to create a mini magazine to highlight Austin magicians and culture. This program was distributed to audience members for the 2014 program at the Scottish Rite Theater in Austin. This was designed as an eye-catching way to explain to sellers how to participate in the auction. It was produced as a flier and a poster. This brief animation was used as an opening “bumper” for a series of videos aimed toward IBM partners. It was created from the original logo artwork and animated in the open-source Blender application. An advertising postcard needed something that suggested diamonds and Texas. 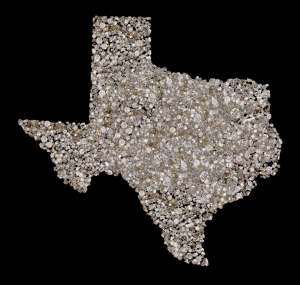 Nothing was available for use so this was manufactured using pictures of real diamonds made to look as though they had been arranged in the shape of Texas. It was all done with the open-source GIMP tool.